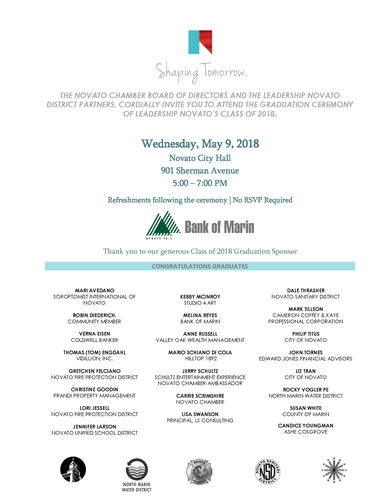 Please join the Novato Chamber of Commerce in congratulating the Leadership Novato Class of 2018. We would especially like to thank this year's partners: The Novato Fire District, The Novato Unified School District, The Novato Sanitary District, The North Marin Water District, and the City of Novato. Thank you for all of your support and making this year's Leadership Novato class possible. FREE; bring your friends and family!